The Lugansk Aid Center (the official name is different and totally tooth-rattling) keeps score of many families. 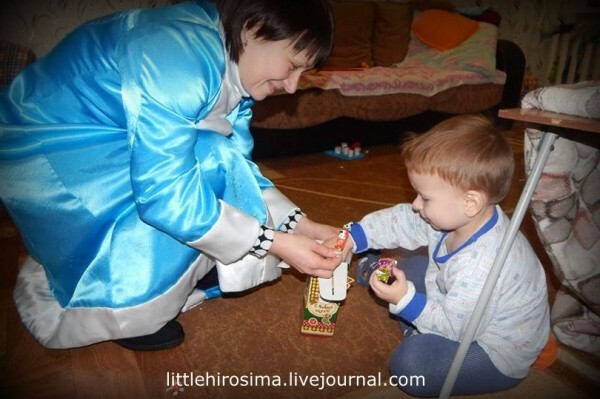 With multiple children, without fathers, with adoptive children, with disabled children–everyone who for one reason or another found themselves in a “difficult situation.” They receive help within the center’s abilities. After 2014 the number of such families sharply increased. 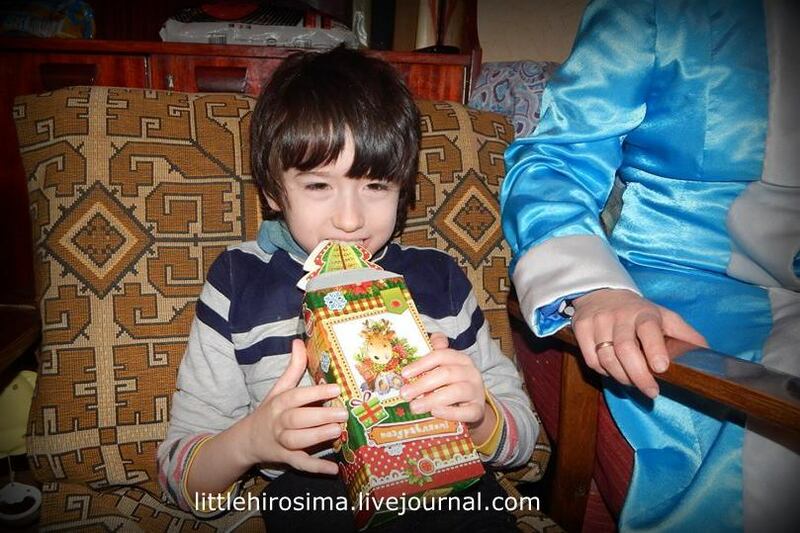 It also included refugees, who fled to Lugansk from border zones. Many lost their homes, relatives, and other sources of aid. There were many wounded, many people who lost relatives, many disabled. The situation of families who were struggling before the war became utterly desperate when the war began. Unfortunately, there are many women with children who were abandoned by their husbands and have to live on crumbs. 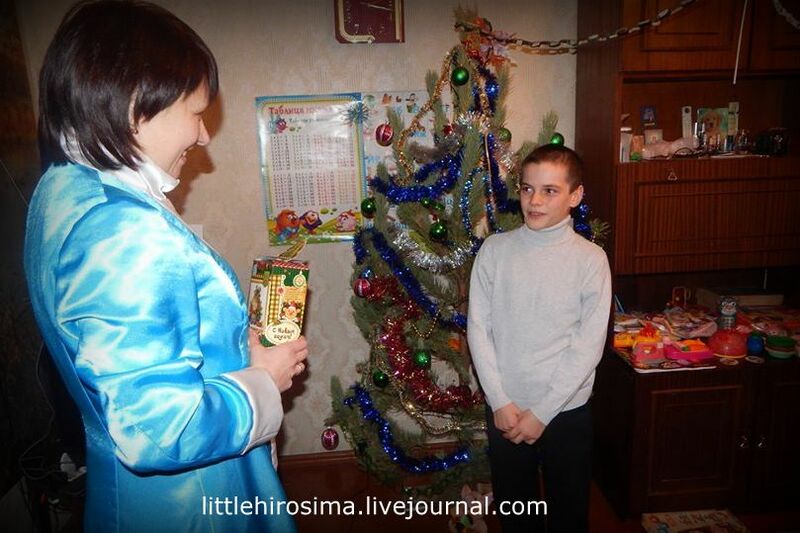 There was a New Year’s tree ceremony held for them, during which we, for the fourth year running, give presents to the children. But there were also kids who were unable to come. These kids are disabled. 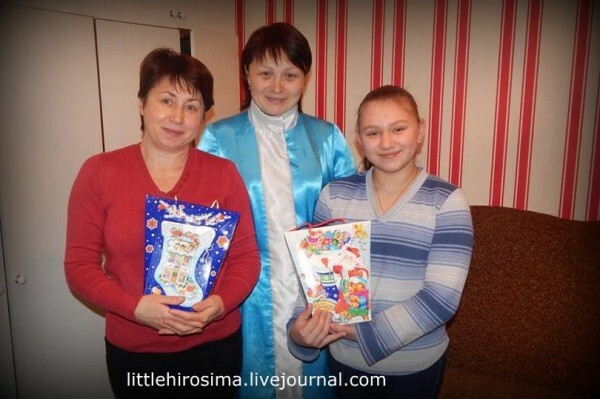 We came upon the idea several years ago of visiting these families to bring them presents. I did that myself last year. By the end of the day I was prostrate with fatigue but it was genuine happiness. 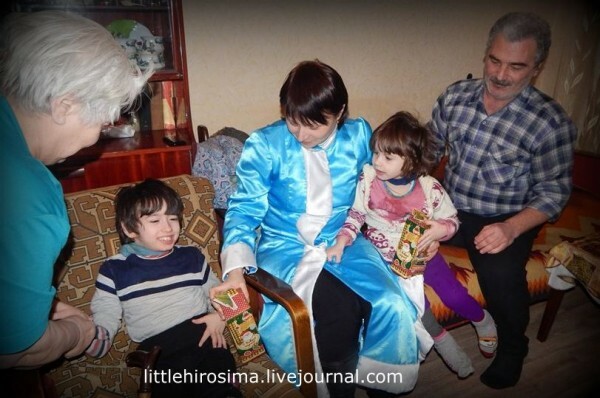 The happiness of children, their parents, grandparents. Both the children and the adults sang, danced, and even cried from the joy and the unexpectedness. 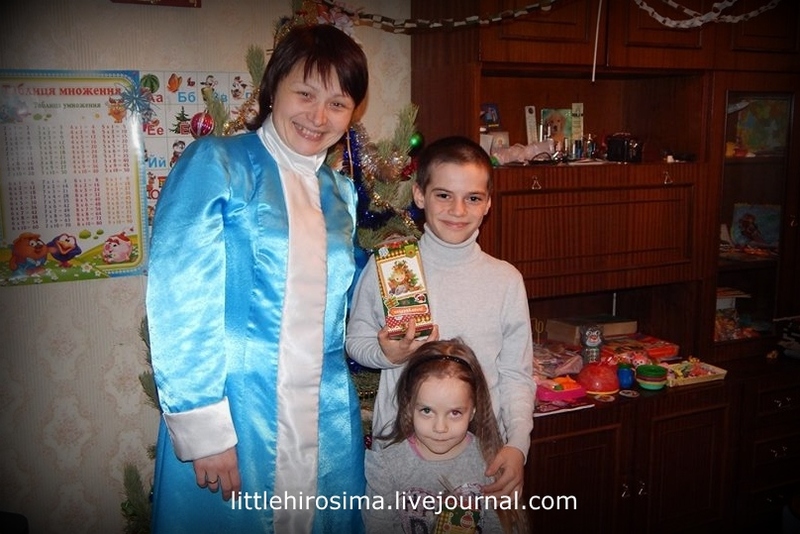 This year I passed the baton to the amazing Olya, a social worker at the Lugansk Center. 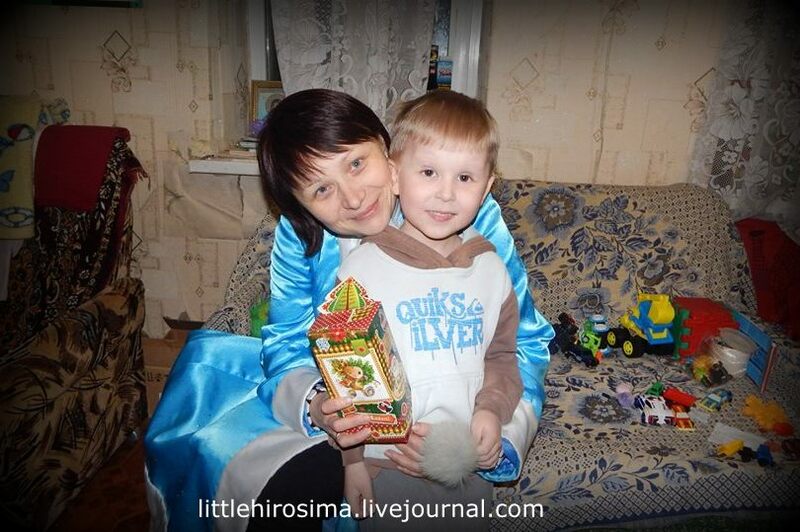 You should remember Olya, we keep helping her cancer-stricken mother with medications. 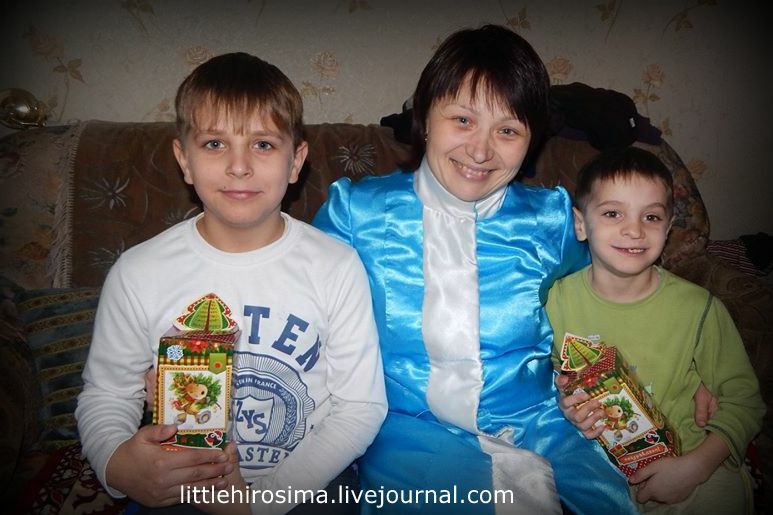 Here are some photos of Olya the Snow Maiden with the kids. 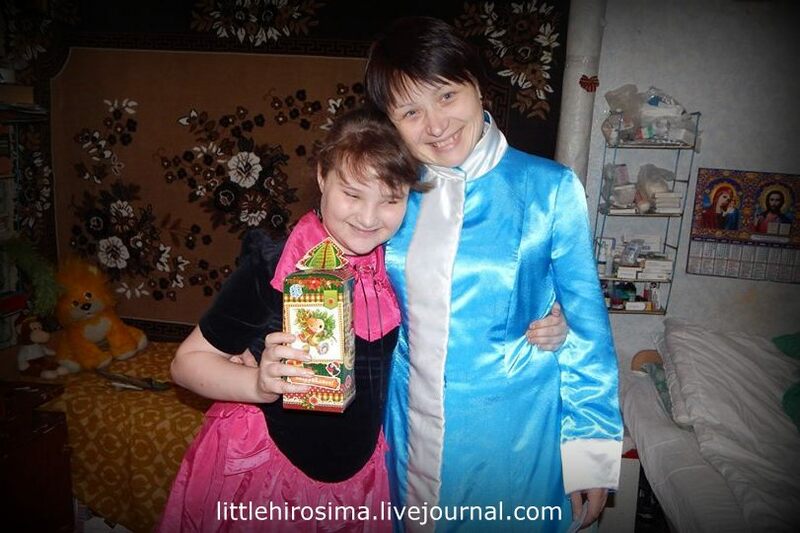 Various kids–some have mental deficiencies, others physical ones. Yet others have none, but all of these kids and their parents are struggling. You don’t know most of these kids, though others you’ve met on the pages of my journal. Friends, thanks to all of you who helped make this holiday for the kids! 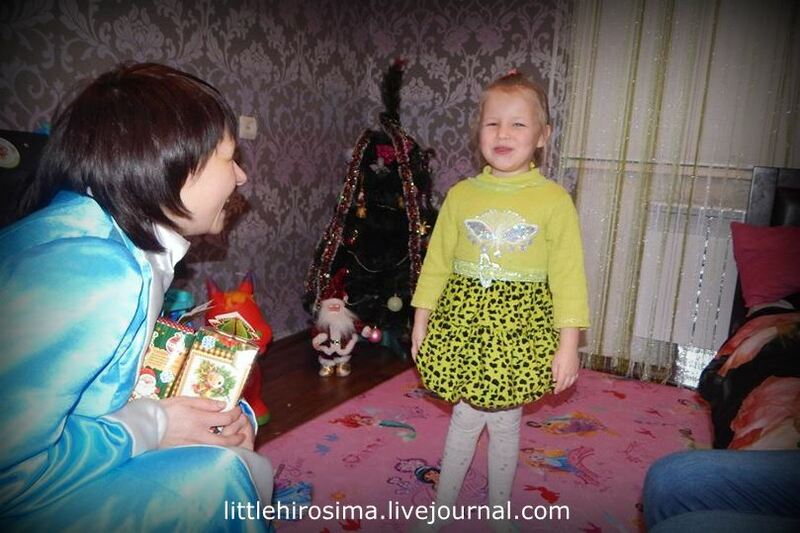 You can’t imagine what it means to them to be visited by Grandfather Frost and the Snow Maiden. It’s the happiest of happiness. Special greetings for these special kids! 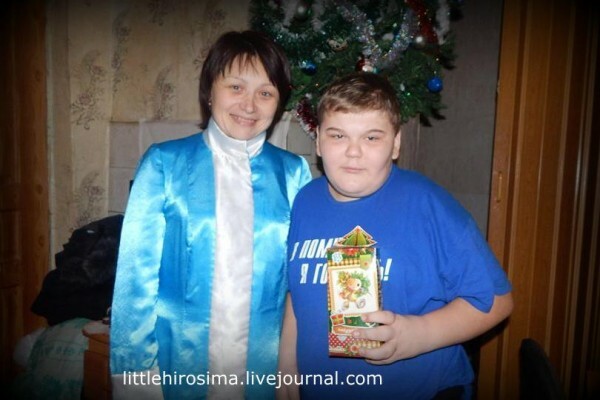 Remember Egor? 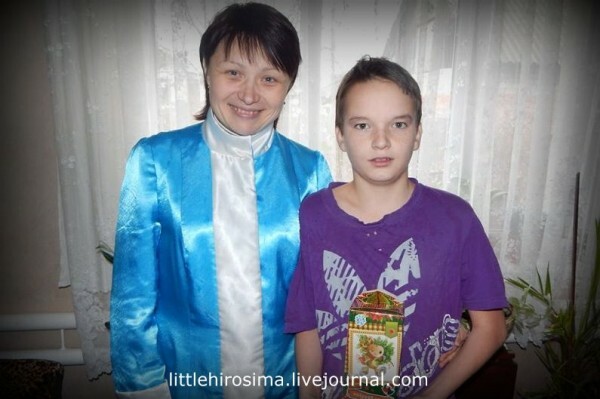 We helped his mom Inna who died of cancer. Egor is also disabled–he can’t talk, walk, he has major developmental deficiencies. Egor and his sister Masha who’s also disabled. 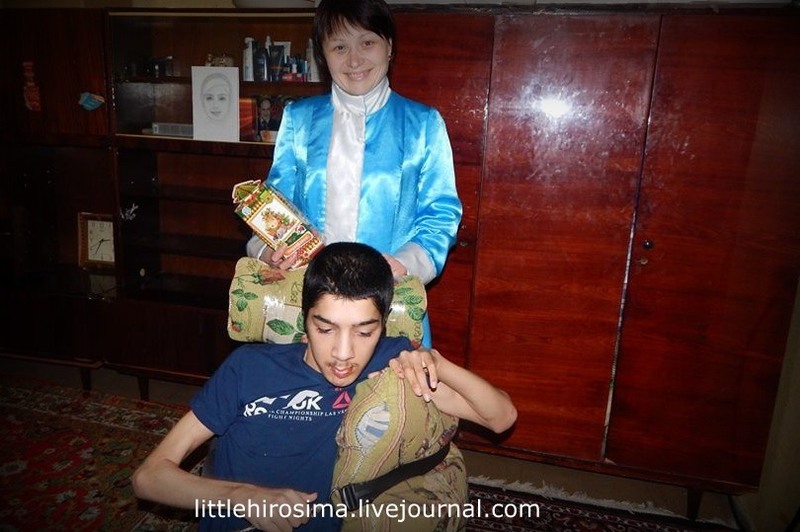 Lyosha, whom we help with medications. 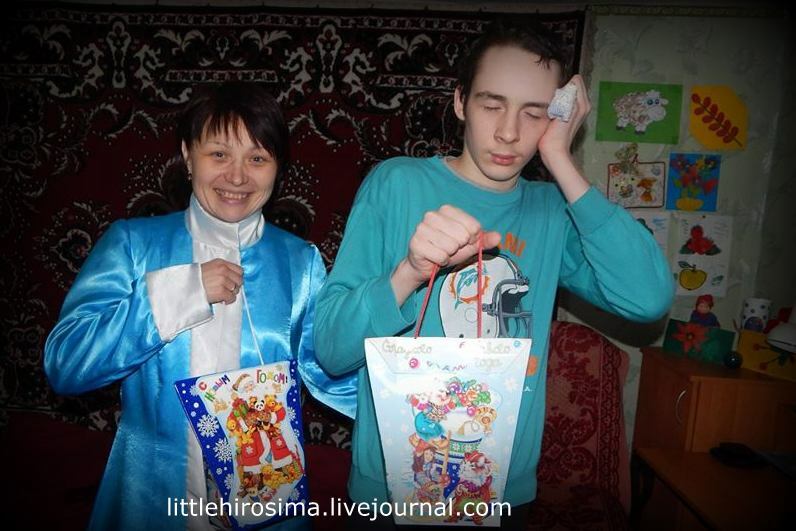 Two brothers, the older of whom is disabled. 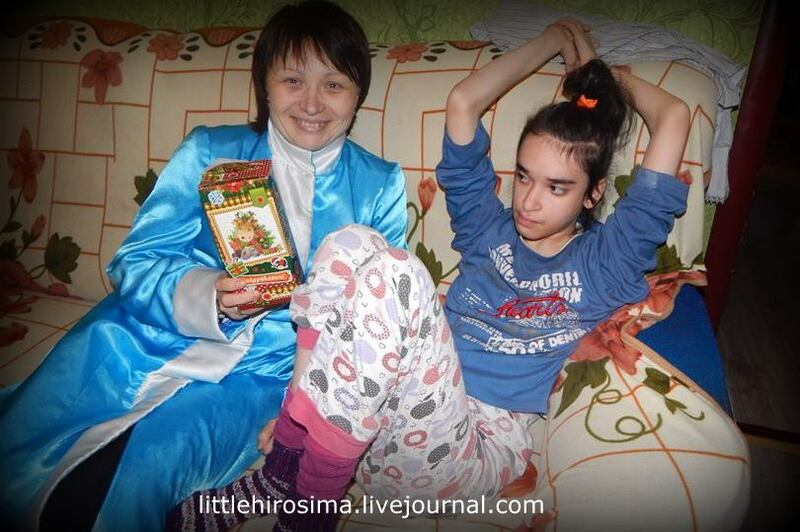 Katya, with a second-degree disability, whom we periodically help. This is our Nikita. 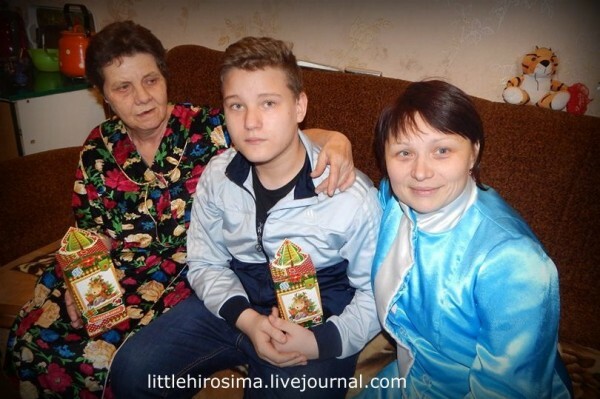 We’ve been helping his family for three years now. The kid was diagnosed with sugar diabetes in early ’16. 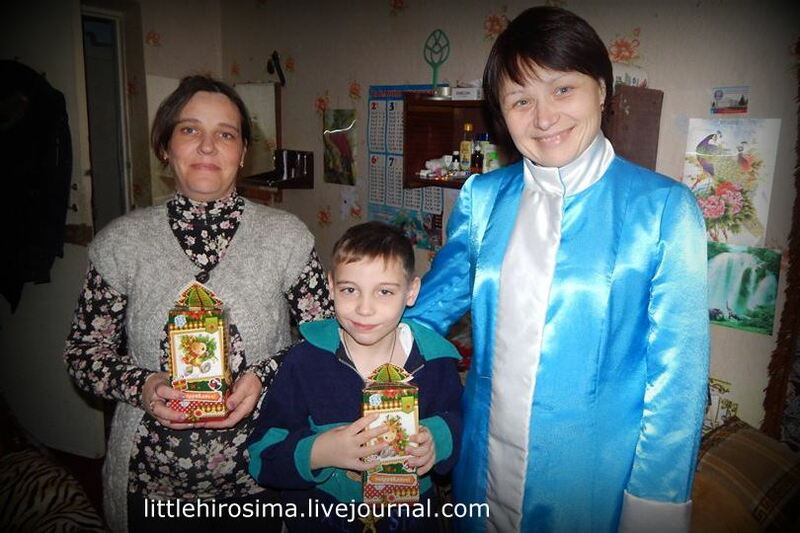 They are refugees from borderlands. They started over in Lugansk with nothing. 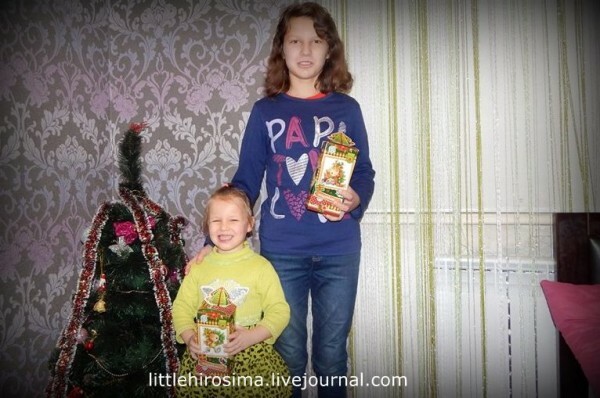 Nikita and his younger sister, born during the war. Rodion, blind and deaf since birth. The younger Margarita has a heart ailment, the older ones have psychological deficiences. 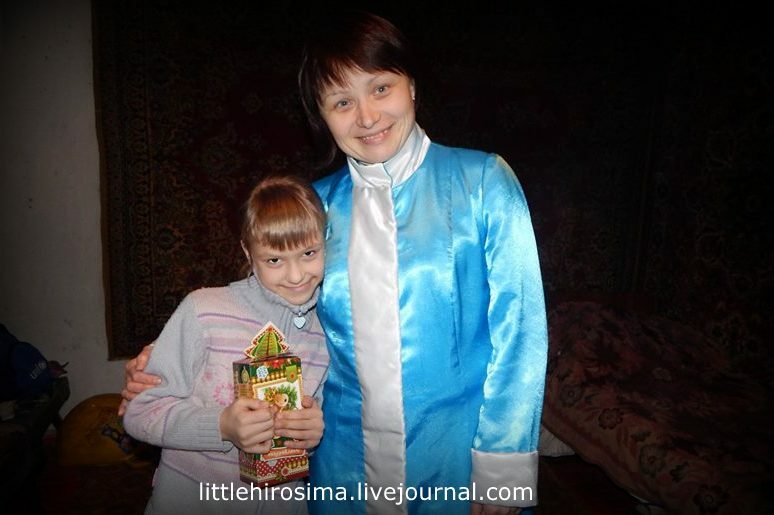 This is Lyudmila Ivanovna with her daughter. They are healthy and all is well. But they couldn’t help but drop in on the way. 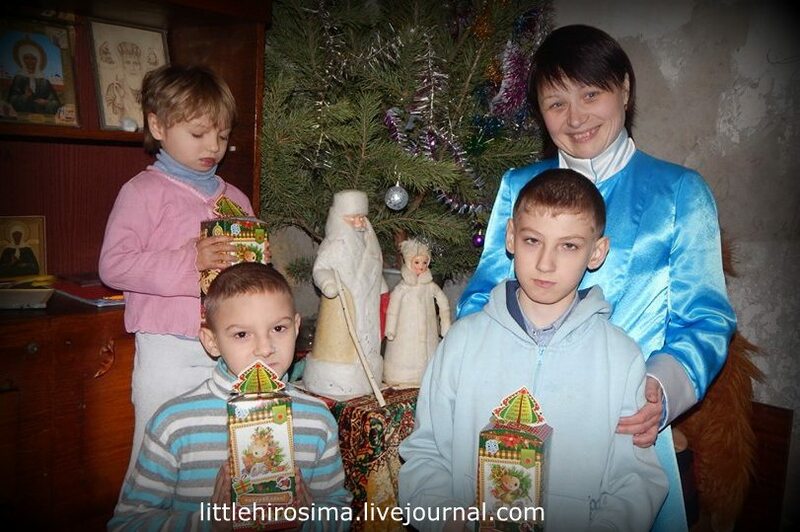 Lyudmila Ivanovna used to be the head of the aid center and carried everything on her shoulders. During the fighting and after, she worked without pay. Pure gold of a woman. 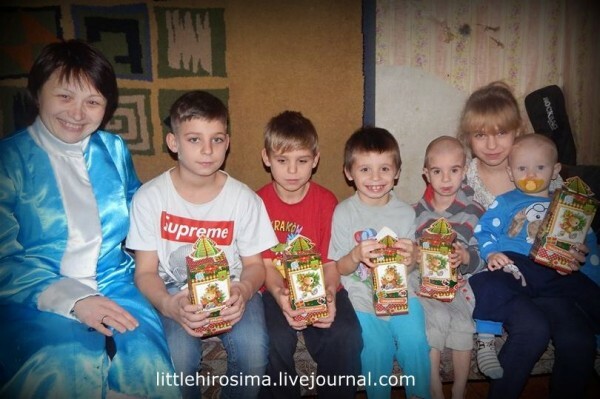 If you want to help the people of the Donbass, please write me in person through LiveJournal, facebook, V Kontakte, or email: littlehirosima@gmail.com. Paypal address: littlehirosima@gmail.com. 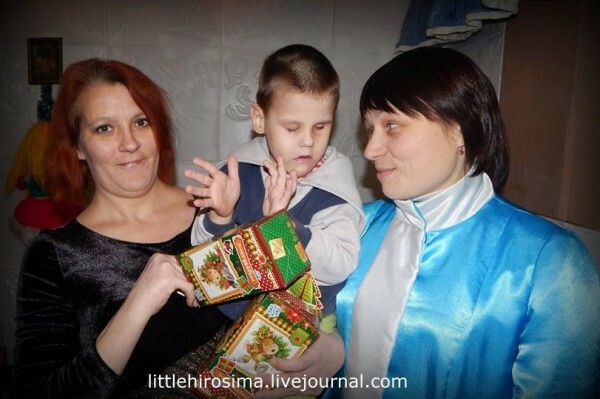 This entry was posted in in English and tagged disabled, LGTs, New Year, Otabek, people we helped, presents by Михаил Ясинский. Bookmark the permalink.